We know the Safe Jacket, wardrobe stalwart, work staple, dependable travel companion. I once deplaned from a business meeting to find the overhead bin stuffed with four identical black man-tailored jackets. I found mine by the label. That's when I decided to forsake conventional blazers. I'm shopping for a jacket, and am not a woman who can pull off Ines de la Fressange's trick of buying a blazer two sizes too small to make it "cuter". I'd estimate the percentage of Passage readers who can do so is lower than my milk-fat choice. So let's look at some jackets that avoid the safe, man-clone look. Some price points are high, but we will consider them so that we can apply the three guidelines that signal a smokin' jacket, whatever our budget. 1. Look for an element of surprise. Don't you tire of the sea of collar-and-lapel cuts on offer? I would like to avoid that convention altogether. Isaac Mizrahi wool bow jacket, $2,277 from Saks. The front is strict; then she turns. 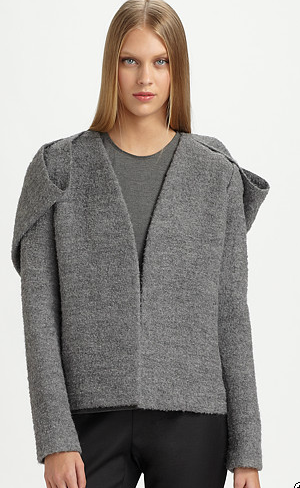 KaufmanFranco's jacket, with a knit body and leather sleeves smokes superlatively! The merino/baby alpaca is going to feel fantastic. 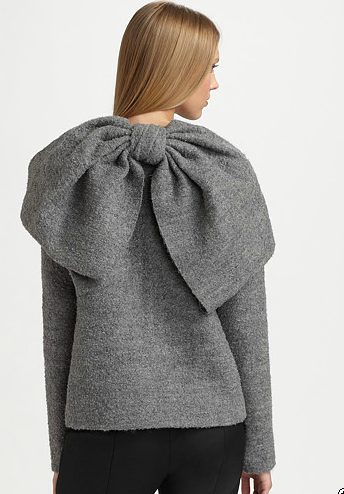 But all that style and sass comes at a price: $1,695 at Neiman Marcus. When I found this, I swooned, sighed, murmured "Frrrrench". 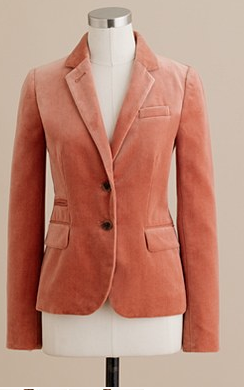 Carven have gentled classic tailoring while keeping the impeccable line, all in soft taupe. 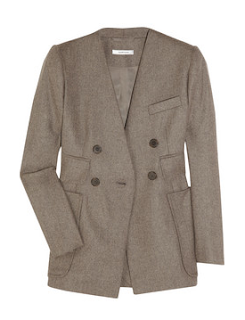 The pocketed wool flannel blazer is $800 at net-a-porter. Colour adds life and richness to the classic blazer body; the art is finding a shade so unexpected that you can use it like a neutral. Boden offer a velvet blazer, one of my all-time beloved items, in a range of patterns and colours, including leopard and tiger but not a very subtle leopard or tiger. I'd look like a plush toy. My favourite is the vibrant mallard. (I have avoided Boden for years because of their exorbitant shipping rates and iffy quality, but a friend says they have improved.) Price, £75. J. Crew's velvet schoolboy blazer comes in tantalizing colours, including this dark blossom, and the moody olive moss; price, $168. 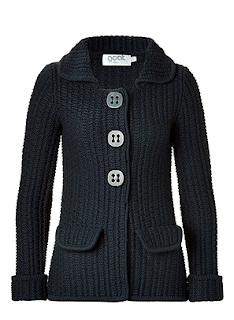 A knit jacket fills the need for polish, with the bonus of comfort and packability. Maybe, I thought, after unbuttoning endless stretch wool fabrics, I need a knit. 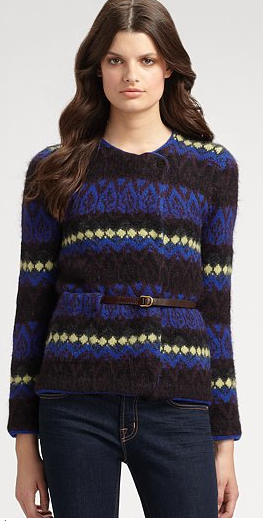 Rachel Comey Fair-Isle knit jacket, $380. Defined shoulders and a belt elevate this from being just-a-sweater, and the pattern will work with any neutral. 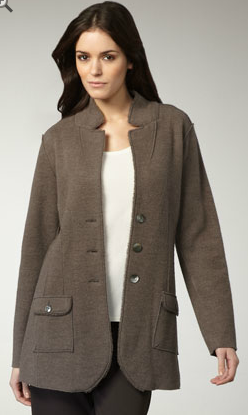 Boden's Barcelona jacket, shown here in fig melange, has the sophistication to skip from jeans to workday. Price, £89. Goat Langley Knitted Jacket in petrol shows the detail I would expect when investing €465. 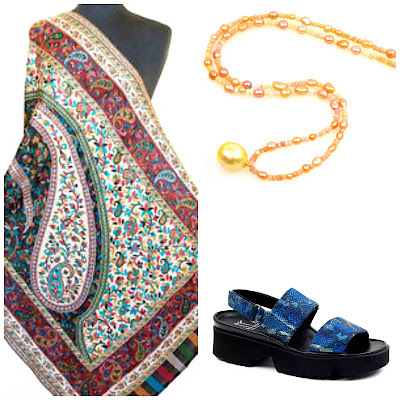 Worn with soft pants or a skirt, this smokes in a most rafinée manner. Also available in rose; at Stylebop.com. So far, I'm still looking, but swaying toward soft, no collar or lapel unless it's one of those intense velvets. You can't have smokin' without some heat! Let Ines keep her Barbie sized jackets. These are all wondeful choices. I like all of the choices you have here...some are really cool...but I think the first jacket from SAKS is a staple that should be in every woman's closet! and it should fit ...not be too small!! I've been moving toward knit jackets myself. Will have to have another look at Boden! I also love that number with the leather sleeves, vraiment smokin'! I'll confess, though, every fall when I see some chic woman in one of those velvet blazers, I want one. I do better with the belted knits than a regular structured blazer. Thanks for showing some of the knits here. I like the choices. I'll take the Boden Barelona jacket if you please! Looks stylish and cozy...a winner in that shade too. 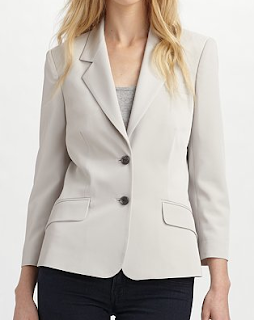 I would never invest much money in a blazer that wasn't a classic. For "fun" blazers, I buy the J.Crew schoolboys. But, those are great blazer that you've shown. I think the Carven though, would add extra pounds to the sides of most women, and for me, not a look I'm going for. Wanted to add that anyone looking for a knit jacket should look at St. John. I know they CAN by dowdy, but some of them look like Chanel. I have a black one I bought 10 years ago, and it's still one of my favorite jackets, and btw - most comfortable. The purple one is my favorite. It looks chic AND comfy. Love that jacket with the leather sleeves. Expensive yes, but has the feel of that Haider Ackerman jacket (leather with satin sleeves) that would be my choice if my bank accounts were large enough and my figure small enough (largest size made was a high-end designer 8), and probably more wearable to boot. And I increasingly think I would never again invest that much money in a boring basic or classic, only in special pieces that make my heart sing. I've had my eye on the Barcelona jacket for a while... May have to go ahead and order it once I get to the other side of the pond. 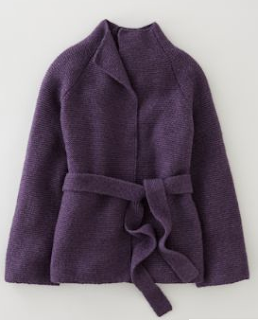 As I'm making my packing list, it's getting clearer and clearer that my accent color this fall is going to be what a friend calls "muddy purple" -- so why fight it? Coffeeaddict: I wonder whether women above size 4 enter her mind. Pam: Mizrhi, when not constrained by the mass market imperatives of Liz Claibourn, can really nail it. pseu: I want one too, especially in dead of winter when everything is grey here. Darla: Good, while these specific ones might not be for you, they give ideas. hostess: They do have petite sizes, but we in Canada must accept shipping from UK, even though we are so much closer to US and they charge a LOT. kathy peck: I got to pet the Carven fall line at a local boutique. You're right, they are built for slim women, and stop at a reedy 8ish. However, the tailoring is so exquisite that they do not add pounds, at least to the women I saw trying them. Many women love St. John; I would like the jacket broken up with other pieces. A black knit jacket is a marvelously wearable item. Susan Tiner: Isn't that the sweet spot! Mardel: I've seen leather sleeved jackets in other lines, too. 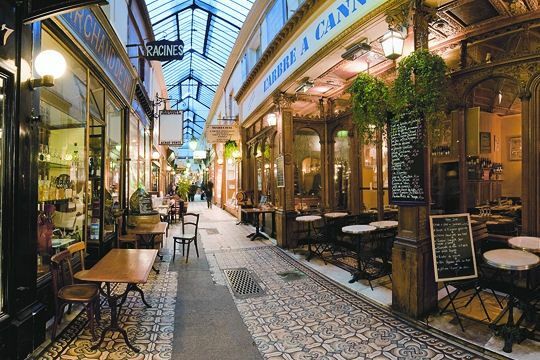 Wonder whether what you need for your new location might have to be lighter? Rubi: I can see how the purples and plums would look terrific on you. Duchesse, that is the main reason I have not snapped up that jacket, or any others. I think my existing supply of cold weather clothing is probably already excessive for the new climate, and if it is not, there will always be a new season. Schoolboy works for me. And Zara has some nice-looking knit blazers that tempt me. Oh yes looking like a plushy is to be avoided and who would wear that jacket with the bow on the back but Barbie en route to the mental institution. The Carven is beautiful and I really like some of the colours in Boden this year, they have a beautiful emerald green. St. John's is a good idea, as is Pendleton (they're working on their line). I'm looking forward to a Margaret O'Leary shop opening near me--I had a sweater jacket of hers that I wore for a good 10 years. LPC: Yes, Zara do some hip jackets for those who can fit their sizing. Bourbon: Boden are trying to nip at the heels of J. Crew and thankfully offer a wider size range. Jean S: You put it succinctly. I *love* Margaret O'Leary; you are lucky. 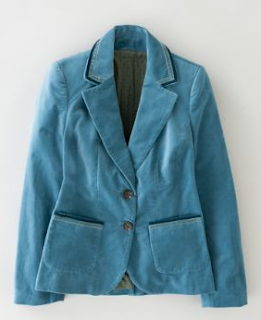 I would love a velvet jacket--preferably in deep, glowing blue--but it can't be a blazer. I have yet to find a blazer that doesn't pour a bucket of cold water over whatever smoke I manage to generate; they are just sad on me. A small, sharply tailored one-button jacket with narrow lapels, a soft, collarless Chanel jacket with interesting details, a cleverly designed, not-too-sloppy or voluminous knit, yes. Bring them on! P.S. I really admire the way that Carven jacket uses the structure of those high pockets to shape and camouflage a soft waist. Gorgeous jacket with leather sleeves but am trying to wean myself off black. Am looking at knitted jackets this year I find they are more practical for my casual lifestyle and still have some good classic ones left over from my corporate days. Like the Goat one. C.: Isn't it frustrating to "see" exactly what you need in your mind's eye, then- just try to find it! (Blazers must flatter some women, they make so many.) Carven's new designer, Guillaume Henry, honed his skill at Givenchy and Paule Ka. Chicatanyage: So, what is your strategy? I might ask to borrow it! OOooh, that bowed jacket, delish! By coincidence, I grabbed a (very lightweight, fine) leather jacket by Mackage (Montreal folk, right?) today. Lapels, artisan-look stitching, deep vent in back, and pink lining with gold satin lining ruffles (!) Makes me smile and polishes up whatever I wear with it. Smart (& smokin')jackets rule! I love your round-up. Back to say that lots of us must like that purple Boden jacket -- it's backordered for 11 weeks on the U.S. site! Interestingly, the reviews aren't overwhelmingly favorable for it. People seem to find it too bulky. Somewhat related: what do you think of all the knit ponchos that Eileen Fisher and others are showing? rb: We have the same size (body and wallet)! Rubi: Maybe you can order from UK site (if they have it) and have it shipped to Spain? Garter stitch can be bulky, a lot depends on the pattern and armhole. frugal: Can't stand not having my arms free, same with capes. Have occasionally admired them on others. Hi again Duchesse, do you remember that Vogue pattern with the grecian folds I asked you about a couple months ago, whether it would work with short sleeves, and we decided sleeveless? I got a post up today with pictures. The sleeveless look does work, though it fits a bit big in the shoulders (probably affecting draping). Overall, I like the design at the neck, but the folds don't transition nicely across the bust. I'm still on the fence but doubt I'll end up wearing it due to the bust. I think I might be able to modify the pattern so that it works. Susan Tiner: The casualness with which you use the phrase "modify the pattern" awes me. If I understand you, you would forge ahead with another iteration. That's what separates the serious seamstresses from raw beginners (like I was). Susan Tiner: Your top looks a tad tight in the bust, I see the horizontal lines. (Perhaps it would fit a friend?) Draping is ultra tricky... but now you know the joy of real silk jersey. The blue top is very pretty! Thanks Duchesse, I agree it's too tight in the bust. I have an idea of making in a smaller size so the shoulders fit better (should help draping issue), then adding a back extension for my broad back which should solve the bust issue. Next time I will make it less expensive fabric! Lessons learned. I am glad you like the blue top. C.: What a find; great story. 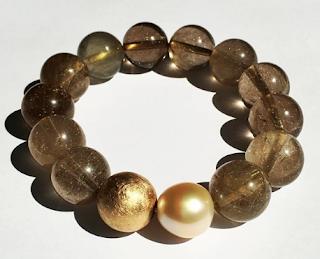 Love that such an exquisite piece will be worn and appreciated.